HUNTINGTON, W.Va. – Dr. Carla Hayden, the 14th Librarian of Congress, will speak at 4 p.m. Wednesday, Feb. 21, at the Joan C. Edwards Performing Arts Center as part of Marshall University’s Dr. Carter G. Woodson Lyceum celebration of Black History Month 2018. 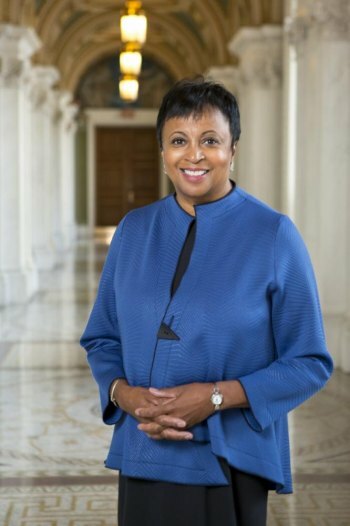 Hayden, who will deliver the annual Carter G. Woodson Lecture, is the first woman and first African American to serve as Librarian of Congress. She was sworn in Sept.14, 2016, after being nominated by President Barack Obama and confirmed by the U.S. Senate. She had previously served as CEO of the Enoch Pratt Free Library in Baltimore and served as a member of the National Museum and Library Services Board since 2010. Her career in libraries began in the 1970s, when she served as a library associate and children’s librarian, and then the young adult services coordinator, at the Chicago Public Library, which includes a regional branch named in honor of Woodson. Hayden has also served as library services coordinator for the Museum of Science and Industry in Chicago, an assistant professor of library and information science at the University of Pittsburgh and as deputy commissioner and chief librarian of the Chicago Public Library. Hayden was the first African American to receive Library Journal’s Librarian of the Year Award for her work at the Pratt Library in Baltimore, where she was involved in establishing an after-school center for teens who wanted homework assistance and college and career counseling. Hayden earned her bachelor’s degree from Roosevelt University and master’s and Ph.D. from the Graduate Library School of the University of Chicago. “She is a past president of the American Library Association and is extremely well-regarded among librarians and the public more generally as a consummate professional,” said Dr. Montserrat Miller, executive director of the John Deaver Drinko Academy, which is helping sponsor Hayden’s visit. “In her capacity as Librarian of Congress, she has engendered renewed enthusiasm for the crucial role that libraries across the U.S. play in preserving the vitality of the open society upon which all democracies depend. The Library of Congress has a special significance with Carter G. Woodson that dates back to the late 1920s, when Woodson reached an agreement about the importance of black history with Herbert Putnam, Librarian of Congress at the time. U.S. Sen. Shelley Moore Capito and U.S. Rep. Evan Jenkins will be part of the program. For more information about Hayden’s visit, contact Morris at morrisb@marshall.edu or 304-696-4635.